Furniture music creates a vibration; it has no other goal; it fills the same role as light and heat — as comfort in every form. Furniture music for law offices, banks, etc. No marriage complete without furniture music. Don’t enter a house which does not have furniture music. The ultimate goal, as Satie wrote, is to “complete one’s property.” The soundtrack to your life. Bam. Music for all purposes and all times, chosen by you, approved by you, completely free of all that is unfamiliar, strange or surprising. In a world where music is so assumed to be as trivial as “property,” improvisation is an affront. Improvisation resists manufacture. At almost any level of sophistication, it also demands attention. Anyone conscious of listening to an improvisation knows that it is a unique moment in the history of the universe, and that to experience this unique moment requires a certain mindfulness. This is not to say improvised music cannot serve as background–obviously it often does–but rather that its existence as an experience goes against all modern notions of art as a piece of property or as a material of any sort. To appreciate an improvisation requires an audience to yield to it, to be in a conversation with it, and to accept it as both uncertain and irreproducible. While music has largely lost these qualities, dance has retained them. To understand a theatrical dance, even a composed one, is to accept it as essentially irreproducible. That is the allure of live performance, and exactly the allure of live performance that has gone missing from our culture. For the past several years, Paige Barnes has been working at the fringes of live performance in Seattle. She has explored the boundaries between live and recorded dance in her pieces such as War Is Over, and musical collaboration in Marriage at the Eiffel Tower, but much of her most interesting work is in the realm of dance improvisation where she often combines these interests. Ms. Barnes does exactly that in her latest work, Naked. The first in the 2013 series of Space Available site-specific residencies at Vanessa DeWolf’s Project: Space Available, Naked finds Ms. Barnes continuing her exploration into archetypes within her unconscious. This time, however, the space is quite different from Ms. Barnes’ work on Lead Bunny. Where that work used the narrow space of the Hedreen Gallery essentially as a proscenium, separating the audience into its traditionally passive spectator role, here Ms. Barnes forces the audience to encounter the space itself. Not only is the project space filled with improvised music, it has been turned into four distinct environments, each appropriate to the dance section that occurs within it. Each environment creates a different relationship between the audience and the space itself. The audience walks through the space and stands during the first two sections and at all times is conscious of the artifice of the theater. The show’s four sections each elaborate upon a different basic image within that space. Returning to a recurrent theme in Ms. Barnes’ work, the second section explores the presence of projected imagery in a live space. Here, however, the exploration is less obvious than War Is Over or Lead Bunny. Rather than an simple interaction with rear-projected imagery on a flat plane, the tableau here is more ambiguous. Behind six slightly translucent hanging glass panels sits a confined chamber with only a table on which Ms. Barnes lies, quite indistinct through the glass but visible just below it. A projector beams images of Ms. Barnes wriggling upon the creaky wooden table. Her face is never visible, only her body from the shoulders down. The feeling of watching it at first is strange then becomes menacing. The ambient light changes from green to red. Slowly her face begins at times to dip into the picture frame, fleeting at first, then steadily. Ms. Barnes stares blankly into the lens. Voiceless words begin to form on her lips as she pleads/argues with an invisible partner. Her face begins to contort with emotion then transfers its contortions down her spine to her body, ending the scene in a paroxysm of emotion that stops suddenly. It is a remarkable variation on the theme of being trapped in a space that is as much psychic as it is physical. From there Ms. Barnes begins a contrasting section in which she sits in a chair, ritually painting herself red (a sly reference, perhaps, to her earlier piece I’m Hungry). It is simple, mundane–a welcome change from the sometimes difficult movement of the first two parts. But it continues the subtly disconcerting feeling of those pieces. The presence of two glass mirrors on the wall behind her reflect her body but also the emptiness of the room. One is suddenly thrust into the Book of Daniel. 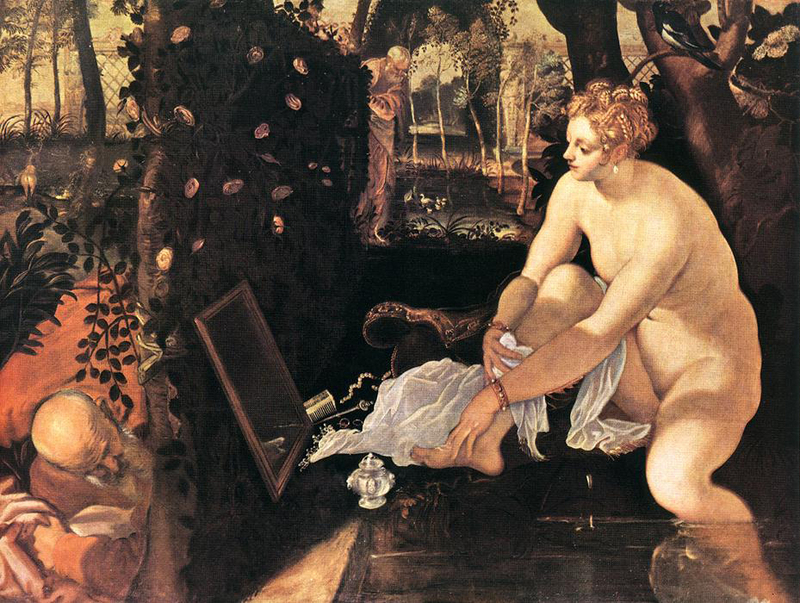 But this is not a relatively coy version of Susanna and the Elders by, say, Tintoretto. In the way it forces the audience into a kind of voyeuristic position (no surprise that this is the first section in which the audience is asked to sit down rather than walk around), the piece develops an atmosphere more akin to the menacing version of that tale by Rubens. Only there is no victimhood here. This is a woman both possessed and self-possessed. Ms. Barnes says that the work was deeply influenced by Kiki Smith’s work, and it is certainly viable to compare this section to Ms. Smith’s versions of Mary Magdalene or her cadaver work. 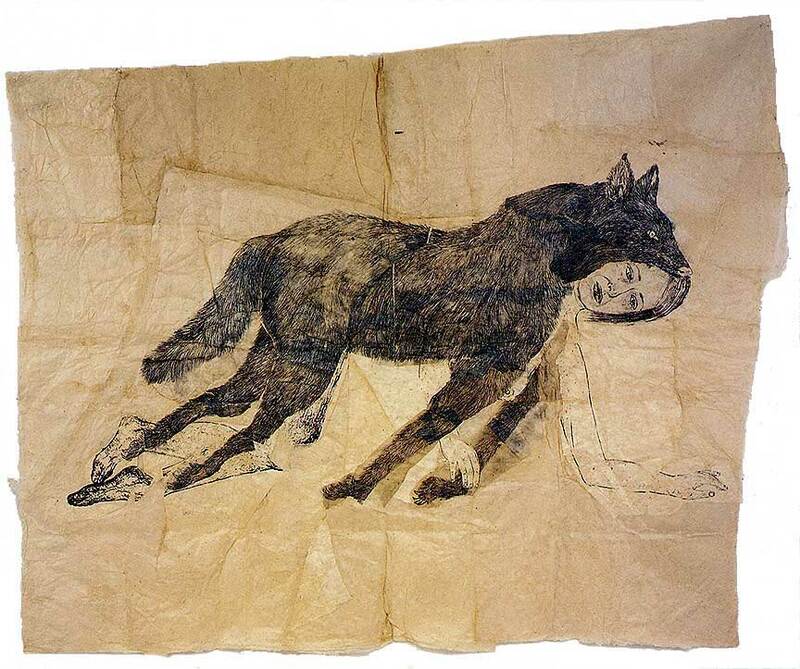 If the influence of Kiki Smith is subtle in the third section, in the fourth and final section it is explicit. With each red stroke, Ms. Barnes moves immediately from the third section into the final one, transforming herself from the sitting beauty at the beginning of the prior section into an image of La Loba, the Wolf Woman–a dear image to Ms. Smith, and the source of her series of Ste. Geneviève drawings. The entire section occurs in a distinct area of the space completely covered in dirt and soil, where Ms. Barnes as she-wolf figure animates these archetypal images. She explores the relationship not only of woman and wolf, but also of woman and wolf to the earth below their feet. In this way, the circle closes: beginning in earth, ending in earth. As an improvised piece, it coheres as a dreamlike tour through archetypes that are typically feminine but also strikingly individual. Naked shows Ms. Barnes in full command of her vocabulary. It is eerie and beautiful, and a little like being a sleepwalker through someone else’s dreamland. By restricting the audience to a group of ten people, the evening gains immensely in intimacy. There is a palpable trust between artist and audience here that spreads, I feel, to the audience itself. That ineffable power of liveness occurs only when there is a live audience aware that it is in the presence of something that will never be seen again, something special. And above all, Naked is special. As an improvised work, each night of Naked is necessarily different; each night, too, has a different accompanist. The night I attended, Ms. Barnes’ musical accompanist was the divine Ms. Beth Fleenor. Ms. Fleenor herself is a dynamo very much like Ms. Barnes and their sympathetic relationship is immediately obvious. So is their conversational tone. From the very first moment that both women pick up maple seeds from the floor, one can see the women responding to the same stimuli and to each other: Ms. Barnes uses the maple seeds to accentuate her visual movement, while Ms. Fleenor turns them into rustling musicmakers. It is extraordinary to hear the two women in their lead-and-follow interplay, with Ms. Barnes sometimes letting Ms. Fleenor hijack the lead without so much as an audible seam. It is everything wonderful about improvisation: immediate, sensuous, palpable, fragile, irreproducible. To purify the entire experience of dance by reducing it to an intimate space, with a purposefully small audience, a returning dance to its improvisational roots might seem like madness. While dance maintains its tradition as an immediate and live experience, nevertheless many viewers find improvised dance to be difficult. As with improvised music, it requires one to surrender to it. It requires, too, a keen attention–a diminishing commodity in a terminally distracted culture that can barely pay attention to a conversation without looking at a screen of some sort. However, Naked rewards such attention sevenfold. Certainly Paige Barnes is not going to get rich quickly by performing shows like Naked. But then, her goal is not furniture music–or furniture dance. And there are more important things than merely completing one’s property.